Bill Hope: His Story. In this novel, the second title in my Metropolis series of historical novels set in nineteenth-century New York, a street kid named Bill Hope pours out the story of his career as a pickpocket in a torrent of words. For this and other titles, see below at the end of the post. Weeks ago I meant to do a post about the apple, but the banana snuck in and upstage it; the apple didn’t have a chance, since the banana was backed by the CIA. (See post #315, “Bananas, Chiquita and the CIA.”) But my fondness for apples brings me now to the subject, with appropriate scorn for that phallic yellow interloper from Central America. Apples, after all, are a major product of New York State, which in this regard is surpassed only by that fructiferous johnny come lately, the state of Washington. My love affair with apples began long ago in my Illinois childhood, when in the fall my family would drive out into the country to buy produce from the roadside stands of the Luxemburgers, as the farmers in the area were called, being presumably from the tiny duchy of Luxemburg. We would come back laden with corn on the cob, potatoes, beans, and other vegetables, and a bag of apples, our favorites being Winesap and Jonathan. Those roadside stands, and the farms that offered them, are long since gone, supplanted by ruthlessly expanding suburbia, but the memory of those excursions is fresh. It was later my great good luck that I came to New York City (also known as the Big Apple) and there, in time, discovered the Union Square and Abingdon Square greenmarkets, where every fall apples appear in abundance. At Abingdon on a recent Saturday one stand that specializes in apples and apple-based products offered no less than seventeen varieties of apples. 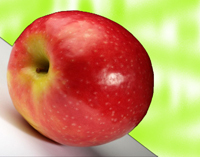 Commonly available are Macintoch, Red and Golden Delicious, Fuji, Winesap, Gala, Cortland, Rome, Ida, Jonagold, Braeburn, Paula Red, Empire, Honeycrisp, Granny Smith, and others, including some unfamiliar ones recently hybridized. Described as sweet or tart, crisp or creamy or mellow or juicy, most of them come from upstate. One October, when I was on a bus bound upstate to a cousin’s wedding, on both sides of the road I saw miles and miles of orchards, their boughs heavy with apples just begging to be picked. Many of them, I’m sure, soon ended up in the greenmarkets of New York City, where, in the month of October, being newly picked, they have a taste that will never again be matched. Usually, at that time of the year, I was vacationing on Monhegan Island, ten miles off midcoast Maine, where wild apple trees bear generously all over the island, some of the apples edible and some not. One isolated tree in the woods I accessed by a deer path, using a borrowed apple-picker to harvest loads of slightly tart apples that were good for eating and perfect for baking. The tree was on a hillside, and a few tantalizingly plump apples at the very top of the tree always remained out of reach of the apple-picker, and if I shook the tree to bring them down, they fell and rolled right down the slope into the brush and disappeared. When my bag was filled to the limit with apples, I would lie in the dry grass near the tree, watching a patch of blue sky traversed at intervals by soaring gulls and an occasional peregrine falcon, and reveling in the silence and solitude. This went on for years, my apples in great demand by friends in the village for baking, until the island’s deer were eliminated so as to remove the threat of ticks, and the deer path became overgrown. So fond was I of that tree, that for several seasons I tried to find a way to it, dodging around blackberry brambles and fallen spruce trees, stumbling this way and that through the undergrowth, until I finally gave it up, poignantly aware that my apple tree was lost to me forever. But not the apples of New York State, including the small, spotted yellow ones growing wild that I have discovered, and sometimes harvested, in Van Cortlandt and Pelham Bay Park. Not that they were always here. Long ago, doing research for a friend’s projected vegan cookbook, I studied the history of foods – yes, each food has a history, and usually a fascinating one – and so learned that the apple originated in southern Russia or Asia Minor (now Turkey), then spread throughout the eastern hemisphere. In the 1600s English settlers brought it to North America, where crab apple trees, bearing barely edible apples, had existed since time immemorial. Today, in this country alone, there are over seven thousand varieties, only a few of them – for me, a few dozen – available in markets and stores. Apples in this country grow from New England through the Midwest and on west to Colorado and Washington state. And yes, there really was a Johnny Appleseed, whose real name was John Chapman (1774-1845), who encouraged the growing of apples throughout the Middle West, though the legendary image of him running around barefoot as he scattered apple seeds all over the place is myth; he was a nurseryman who planted nurseries, left them in charge of a neighbor, and returned after a year or two to care for them. He was also a man of faith influenced by the Swedish philosopher and mystic Swedenborg, and when he died he left to his sister an estate of 1200 acres of valuable nurseries. In all the apple-growing regions of the U.S., small family farms once had orchards bearing varieties of apples now lost, or almost lost, to us, since the apple trees died when the farms were overwhelmed by the advent of industrialized agriculture. But a few trees survived in the woods, or were absorbed by parks and other public lands, and there, today, they can be found by investigators – or should one say treasure hunters – determined to discover at least some of the lost varieties. Have you ever heard of Mother apples, or the Rambo (no, I’m not making this up), or the Nero or the Arkansas Beauty or the Limber Twig? Neither had I until last May, when an article in the New York Times told how volunteer apple hunters, with the help of old catalogs and county fair records, were busy exploring abandoned farm sites in Washington state, North Carolina, and Maine. Will these long-lost varieties finally appear in our markets and stores? Not likely, for they bruise easily, don’t store well, and don’t produce an economically viable number of apples per tree. But these devoted apple hunters, though few in number, are doing their best to recover and nourish these fragments of our agricultural past. But to get back to New York State, few of us think about the farms and farmers that produce the apples now found in our greenmarkets and stores. The upstate farms are often run by third- or fourth-generation owners, and harvested by Jamaican and other immigrants who return for the harvest year after year. Armed with buckets and aluminum ladders, they work ten-hour shifts picking apples day after day, hurrying to be done by late October, getting time off only if it rains … or snows. Usually they sleep in barrack-style dorms on the farm, where, when not working, they play dominoes, drink beer, watch TV, and joke with their friends. Immigrants have been harvesting New York State apples since the late 1960s, when farmers could no longer find reliable local help willing to work at the wages they could afford to pay. The foreigners come under a federal H-2A program that grants visas to foreign workers coming here for temporary labor that now pays $12.38 an hour, more than New York State’s minimum wage of $11.00, and much more than the workers can make when they return home, where they get jobs as carpenters, taxi drivers, and farmers. Conditions aren’t ideal and workers can be exposed to pesticides, but they keep on coming year after year, even up to the age of 70, and it benefits both the home country and the U.S. Without the H-2A program, the apple industry of New York couldn’t exist. Fortunately, the anti-immigrant regime of our Twitterer-in-Chief has not set its sights on the H-2A program … not yet, at least. Happily for all concerned, the apple is just plain flat-out healthy. “An apple a day keeps the doctor away” goes that age-old saying, and there is truth in it. Apples contain malic and tartaric acid, which cleanse the liver and digestive tract, and are rich in the soluble fiber pectin, which reduces cholesterol, counteracts toxins, and removes radioactive residues from the body. And raw apples have beta-carotene, vitamin C, and potassium, all of which the body needs. But be sure to eat the skin, since that is where most of these nutrients are found. If all this doesn’t impress you with the significance of apples, remember that they caused the Trojan War. Eris, the goddess of Discord, threw a beautiful apple marked “For the fairest” into a gathering of the gods to which she had not been invited, and Hera, Athena, and Aphrodite promptly claimed it. To settle the dispute, they appealed to the Trojan prince Paris, to whom Hera promised power and wealth, Athena promised victory in war and wisdom, and Aphrodite offered Helen, the most beautiful woman in the world. Paris chose Helen, who happened to be the wife of Menelaus, and with Aphrodite’s help he stole her away to Troy. Outraged and eager for spoils, the Greeks fought a ten-year war to get her back and in the end looted and destroyed the city of Troy. All this because of that one damned apple! Golden apples were also the forbidden fruit of the Garden of the Hesperides, conferring immortality on whoever ate them. To keeps mortals from eating them and thus becoming equal to the gods, the gods had the three nymphs known as the Hesperides guarding the apples, and as a fiery back-up, a dragon. Only Hercules, as one of his many labors, managed to get past the nymphs, kill the dragon, and claim the apples, which he then, good sport that he was, returned to the gods. The Garden of the Hesperides, as rendered by Edward Burne-Jones, ca. 1869-73.
scene quite a bit sexier. That said, I’ll add a Christian twist. Many believe that the forbidden fruit of the Garden of Eden, though translated only as “fruit” in the King James version of the Bible, was an apple. Others suggest the pomegranate or the tomato, and some subversives have even suggest the banana, whose phallic presence there I myself resolutely reject. (No associate of the CIA belongs in Eden.) Surely it was an apple that Adam and Eve consumed, skin and all, but in spite of all that pectin and potassium, disastrous consequences resulted that blight us to this day. stained-glass window in a church in Carcassonne, France. Eve and the apple, as rendered by Gleb Kalashnikoff, 2007. Would you be tempted? Finally, I’ll add what my dictionary of symbols states for the apple. As a forbidden fruit, it is a warning against the exaltation of materialistic desire, a useful lesson in view of the recent brouhaha of Black Friday consumerism. But also, being almost spherical in shape, the apple signifies totality, is a symbol of the All. So with this in mind, and in hopes of better health and totality, do respectfully gobble down your Macs and Granny Smiths. Does it bring you closer to the All? I hope so. Source note: For information on lost varieties of apple and those who are trying to reclaim them, I am indebted to an article by Kirk Johnson, entitled "In Search of an Ancient Harvest," in the New York Times of May 30, 2017. For information on Jamaicans who harvest New York State apples, I have drawn on an article by Tik Root, entitled "Apple Pickers of Jamaica (Not the One in Queens)," in the New York Times of October 8, 2017. Lordy! Eve, as rendered by Gleb Kalashnikoff, looks just like Kellyanne Conway. At least to me she does.